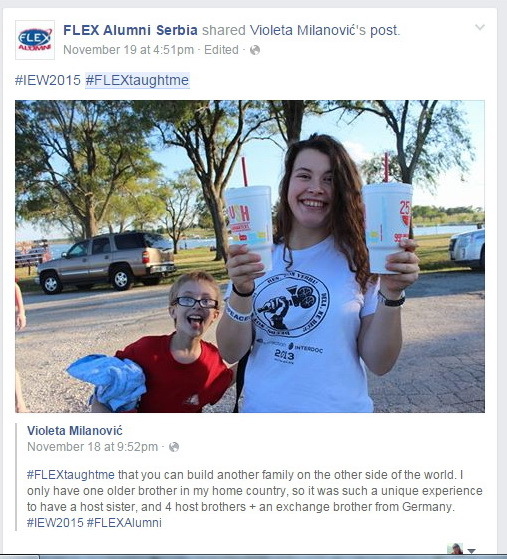 Over 90 FLEX alumni celebrated the benefits of international education and promoted international exchange opportunities during International Education Week (IEW) on November 16-20, 2015! Events took place in 14 cities in 11 countries. Alumni joined the IEW social media campaign by sharing what they learned during their exchange year using the hashtags #FLEXtaughtMe and #IEW2015. 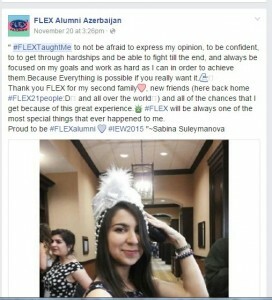 Alumni posted stories and testimonials to the benefit of international education and exchange on Facebook, Twitter, and Instagram, sharing their stories with over 13,500 social media users in their network. 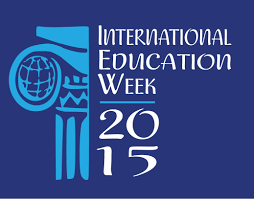 Below is a list of in-person events that FLEX alumni organized in celebration of IEW 2015. Abovyan, Armenia. 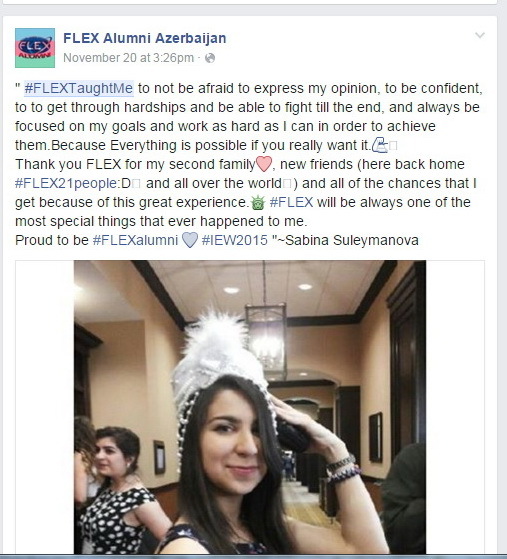 On November 20, Abovyan City Representative Syuzanna Grigoryan ’12 organized a presentation about her FLEX experience for 15 students, sharing information about her exchange year and updates for those interested in taking part in FLEX testing. Yerevan, Armenia. 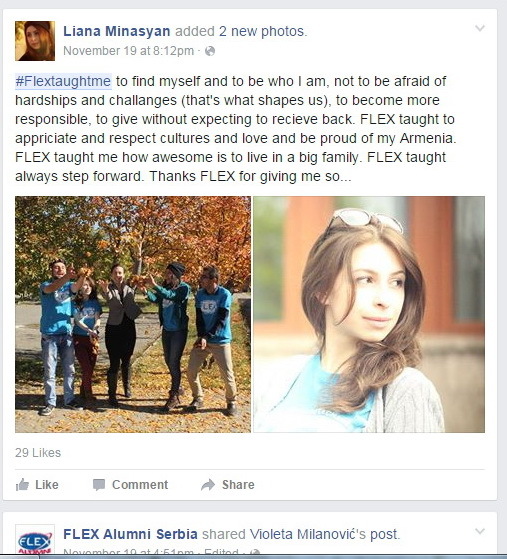 Aram Manukyan ’15 gave an interview about his FLEX experience for the morning news program ArmNews on November 19. The TV channel highlighted the theme of 2015 IEW- Access for All and Aram shared information about inclusive education in the U.S.
Vanadzor, Armenia. On November 21, Vanadzor City Representative Arsen Mazmanyan ’15 held a one-day seminar on the U.S. Education system for 18 local high school students. 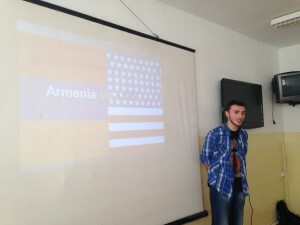 Arsen compared Armenian and U.S. Education systems and shared his U.S. education experience on the FLEX program. Baku, Azerbaijan. 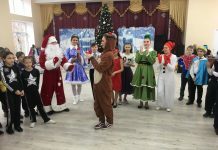 Nine alumni organized a day camp Kids Can Make It Better for 20 middle school students from Baku with the support from the U.S. Embassy in Baku on November 16 – 20. Alumni taught students about community service, held classes on environment and recycling, taught about the importance of health and sports, and led sessions on professional skills. 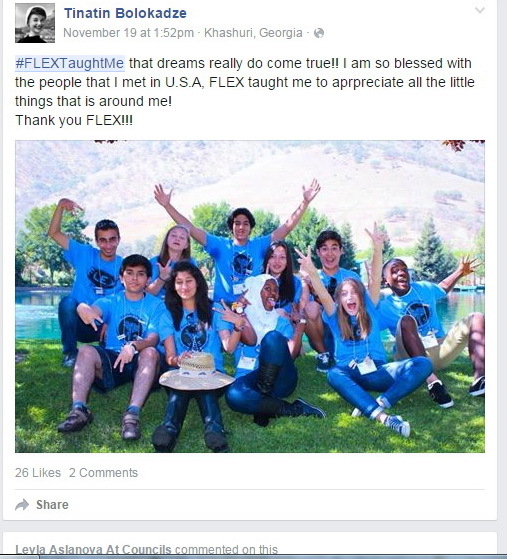 Throughout the camp alumni shared their FLEX experience and encouraged the youth to find opportunities to pursue international education opportunities. Marneuli, Georgia. 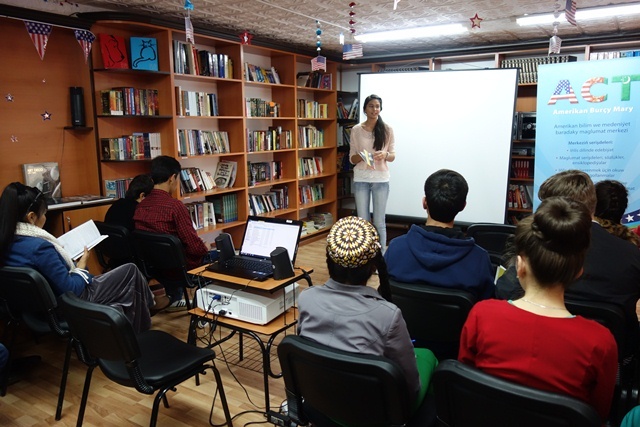 On November 24, Phuad Karaev ’15 together with Peace Corps volunteer Darlene Ugwa organized a presentation for 18 high school students at the Marneuli Youth Center about the importance of education. The alumnus targeted this group to contribute to the development of the Azeri ethnic minority of Marneuli. 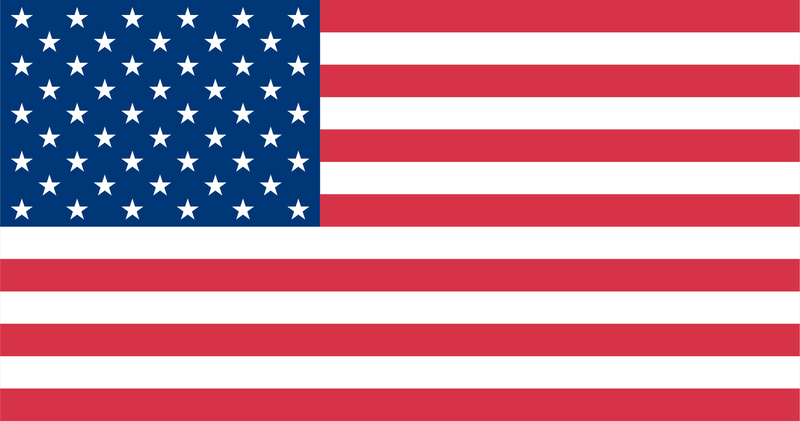 Phuad shared online tools to help students research international education opportunities and introduced participants to the American English Web­site http://americanenglish.state.gov/. Tbilisi, Georgia. FLEX alumni shared their U.S. high school experiences with 10 high school students through the Human Library project. Other guests of the event included students and young professionals from Italy, Mongolia, and Egypt who shared their country’s traditions and education systems with participants. Almaty, Kazakhstan. 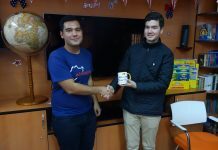 On November 10, six alumni in collaboration with representatives of the U.S. Consulate in Almaty filmed a short video dedicated to International Education Week. Alumni shared their experience of being exchange students in the video, which was posted on the U.S. Embassy Astana Facebook page. Ust-Kamenogorsk, Kazakhstan. 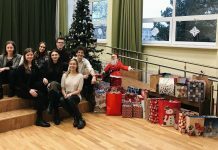 Anel Samekova ’15 promoted the FLEX program through an online webinar at an American Corner in Ust-Kamenogorsk for 15 local students on November 20. 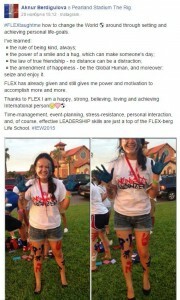 Anel talked about exchange programs available for students and her FLEX experience. Krusevac, Serbia. 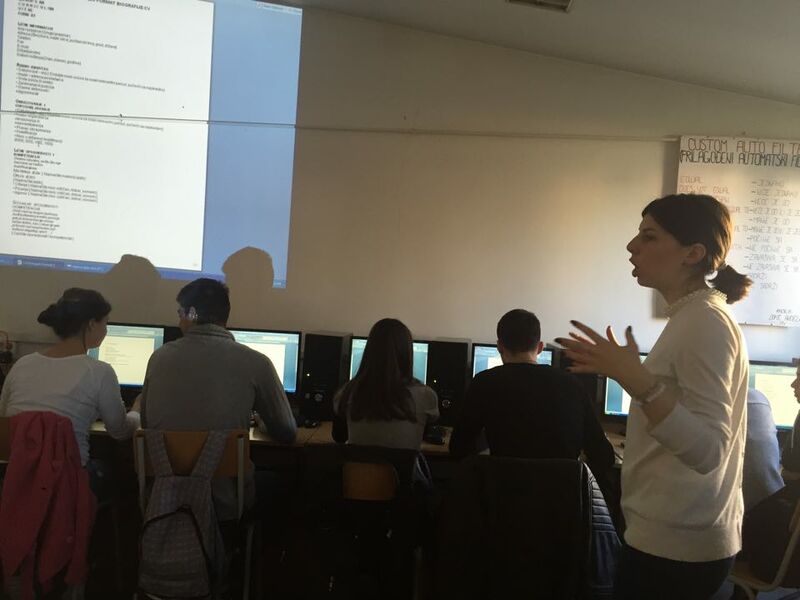 On November 17, three alumni held a workshop on resume writing and opportunities for young people for 20 students at the Krusevac High School. All-Montenegro. During IEW 2015 alumni organized a nation-wide essay competition on the topic of Connecting Youth of Montenegro to the United States. Three outstanding essays will receive award at a ceremony in December. Thirty students participated in this English-language essay competition and a panel of alumni evaluators will select the top essays. Chisinau, Moldova. 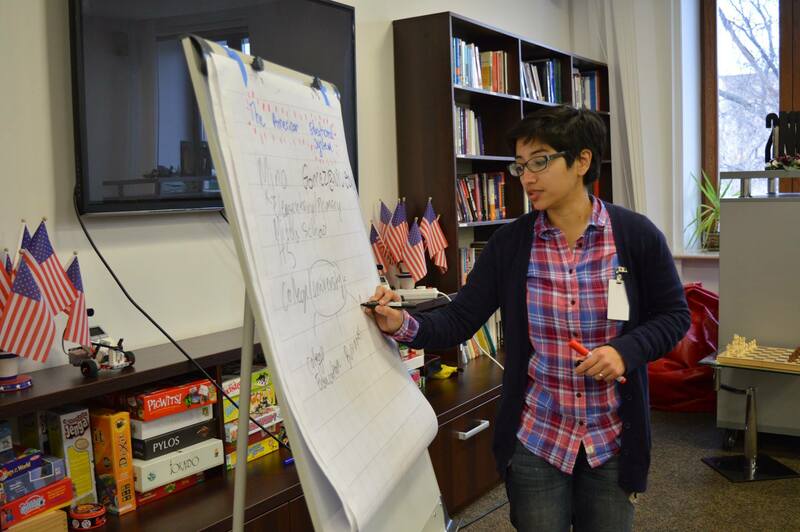 On November 16, Catalina Cucu ’13 organized a training for 15 high school students to teach them about educational opportunities in the U.S. at the American Resource Center. Peace Corps volunteer Herminia Gomez was a guest speaker at the event and talked to students about education system in the U.S. and where to search for exchange program opportunities. Calarasi, Moldova. In celebration of IEW, Valeria Goginetchi ’ 15 organized a month-long series of English language classes for 20 students from Dorinta Disability Center. Valeria promoted this year’s theme of Access for All through interactive lessons, creative games, and fun events for the students of the center. Talas, Kyrgyzstan. On November 15, Altynai Ermenbaeva ’15 and Islambek Ashyraliev ’15 together with Peace Corp Volunteer Tom Leary made presentations about the FLEX program and education in the U.S. for 15 students at the Youth Camp in Talas. Mary, Turkmenistan. On November 18-22, American Corner Staff, FLEX Alumni and local volunteers celebrated International Education Week by giving numerous presentations on the topics of Online Resources for Learning English and Searching Educational Opportunities in the USA, Five Steps to Study in the USA, Preparation for Study in America: PechaKucha, Types of Colleges and Universities in the U.S., U.S. Culture: Trivia Quiz, Understanding the U.S. Diversity: Collage Making Workshop, Hello From America: Intercultural Adjustment and Understanding of U.S. Culture, Skype presentation, and International Treasure Hunt . Over 200 local students participated in the events. Kyiv, Ukraine. Iryna Shuvalova ’02 presented on university admissions interviews for 20 alumni and students of the Competitive College Club. 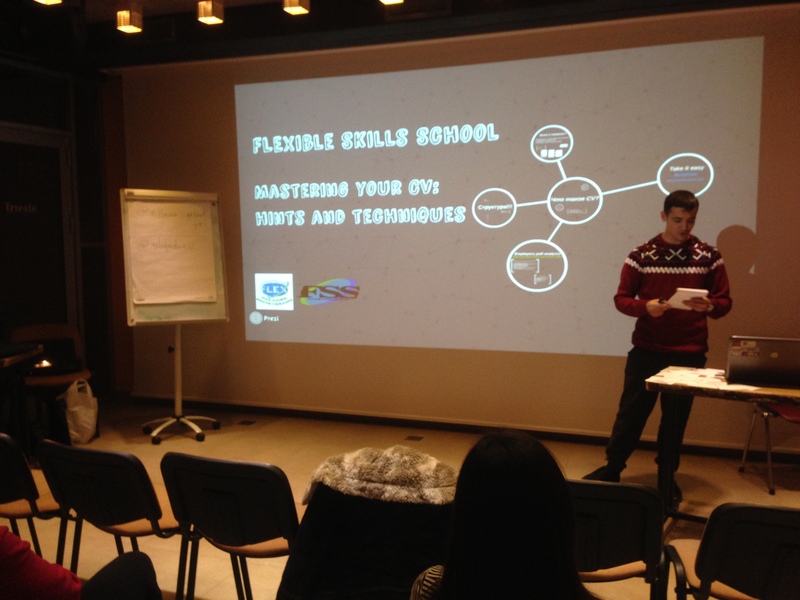 Iryna talked about her personal experience as well as gave participants practical tips and explanations on how to succeed in national and international university admissions interview. Lviv, Ukraine. 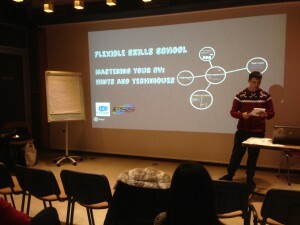 On November 22, eight alumni presented to a group of 20 students at the Lviv City Library. Alumni shared information about U.S. culture, the U.S. system of education, and personally about their exchange year. FLEX Alumni celebrated IEW around the world. In Ann Arbor, MI Marko Delic ’12 (Niksic, Montenegro) who studies at Washtenaw Community College and is the president of International Students Association organized International Education Week event. Marko and four exchange student shared their countries traditions through presentations, food, and dance and shared how the systems of education differ from the U.S.